Can We Crash Amazon Like Lady Gaga Did? I saw a headline the other day, about how Lady Gaga crashed Amazon with her 99¢ music offer. As far as I could tell once I clicked through, the Lady hadn’t actually crashed Amazon. She just slowed it down to a thick cyber-syrup. All because her fans couldn’t wait to join the music craze for a mere 99¢. I considered what it might take for us to do the same to the Book Giant, if we offered a lifetime of poetry fun for a yearly cost of 99¢. I didn’t have any art deco spectacles or 9-inch heels, inverted triangle dresses or purple bouffant wigs. But I did have a red ribbon (and the picture above to prove it). 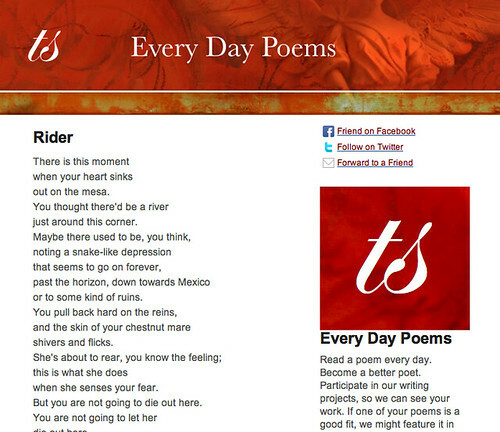 Sign up for Every Day Poems. Then Amazon kindly asks you for 99¢. And maybe we show the world how a little poetry can make a person ga-ga too. I’m in – all in! Also, may I please be added to the Tweet Poet friends list? Just did what I could! How fun! I had no idea you did this! But I don’t think we can crash Amazon, not without a message of empowerment and the joys of dressing in meat. I paid my money. But the Internet is still up. What’s with that?